A few posts ago, I mentioned working on a couple of quilt projects. My motto this year "use it or lose it" came into play when I found 3 big bags of material leftover from past sewing projects. This is pretty funny material because it was all small amounts I bought to make my chihuahua, Rico, bandanas. This is just a sampling of blocks I've put together so far. This is a really easy quilt to make. You can find basic directions HERE. The material is cut into 8 in. 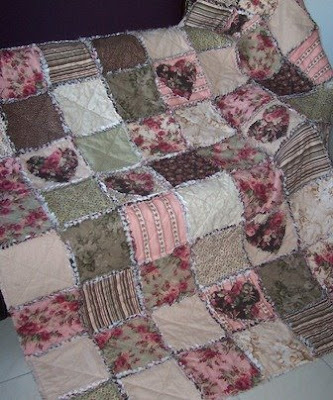 squares, usually a patterned piece for the top and matching solid for the bottom. Then you cut a 6 in. square of batting to go in the middle of the material "sandwich". Stack the fabric right sides out with the batting in between and pin corners and center. 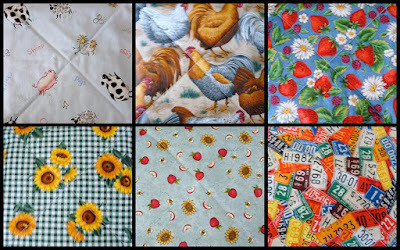 Now do that over and over until you have enough to make the size of quilt you want. That's where I'm at right now. Making lots and lots of squares. When I get enough of them to put the top together, I'll make another post and tell you the REST of the directions. It's probably going to take me another month to make all the squares. I'm cutting out a couple a day in my spare time.